Back in my teenage years, I was a big anime fan (we prefer the term otaku, thank you very much...) and before that I had a lifelong love of Godzilla movies (um, the word is daikaiju...). In fact, when I made an eleven-year-old appearance on the children's game show Zap It!, my "fun fact" was that I owned every single Godzilla movie (at the time there were twenty-two). So basically we can all agree that I have an above average level of familiarity with Japanese pop culture. Pulse is just another example of that. A group of Tokyo residents (Tokyers?) begins experiencing strange occurrences after one of their friends commits suicide, namely that a series of ghastly images begin appearing on their computers when they connect to the internet. Apparently, the hard drive of the afterlife is full and ghosts from the spirit world have begun seeping into our own. Pulse continues the grand J-horror tradition that I am just now beginning to acquaint myself with. I've talked before about Japan and the rest of East Asia's idiosyncratic horror tradition: the visual cues that the Eastern horror canon is based around. We all are familiar at this point with the onryō, the Japanese ghost made famous in the West by the American remake The Ring. The ghosts in Pulse had for me the same sort of Orientalist strange otherness. Appearing as jerkily moving shadowy figures, they were spooky in their own unique way. I think the best thing for a successful horror movie is to make the viewer scared of one everyday thing. Psycho made its audience afraid to take a shower, Nightmare on Elm Street made them scared to fall asleep, and hopefully Pulse will make you think twice about staying up all night browsing Wikipedia. But was it scary? Sure. 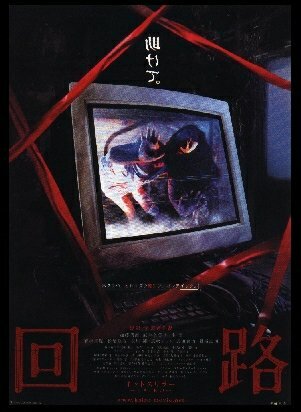 What really was strange about this (and I imagine a great deal of J-horror films) was the lack of breaks in the tension. No comic relief characters who get killed while trying to get laid, just loneliness and death.